Cozy atmosphere, high ceilings & huge rooms. Clean, spacious & friendly comfort. Free wireless Internet/WiFi (50mbs) and Free local phone calls. TV and DVD. We provide tea, coffee and hot chocolate at no charge. Large sunny section with BBQ and clothes line. Off-street parking. 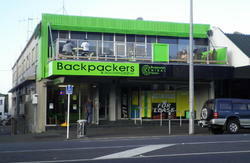 Centrally located in Hamilton - walk to the City Centre or the Claudelands Event Centre. Full continental breakfast - plus drop-scones (hotcakes) or croissants - @ $8.00 pp. Large, sunny section with BBQ.